This salad has a long history. Very long. It started about three (maybe four?) years ago when I ate dinner with an excellent cook named Batya. She made a salad with some roasted vegetables and chickpeas, and I absolutely loved it. I went home and copied it, and served it to my sister. My sister loved it, and made it again, for me, when I visited her. Then I forgot about this salad, and I thought my sister did too. Fast forward a couple of years, when I spent the weekend at my sister’s house. As I have mentioned many, many times here, I am constantly dieting. My sister, in an attempt to make healthy foods that I can eat, scraped the bottom of her memory barrel and came up with this recipe, all over again. I ate it at her house, and couldn’t figure out why I hadn’t included this in the list of foods I regularly eat. I went home and recreated this salad. I added some things, took away some others, and came up with one of the most amazing chickpea salads ever. It’s fantastically easy, too, as it is one dish that includes both your protein and your vegetable! Now, I’m about to let you in on a little secret: I don’t like tomatoes. No, for real, I can’t stand them. In anything. Except this salad. Maybe it’s because they are cooked, maybe the rest of the awesomeness made up for it, who knows? All I know is that I have a new favorite lunch. Try it, and maybe you will too! Chop the tomatoes and peppers into evenly sized small chunks. Slice shallots into half rings. Toss vegetables with minced garlic, olive oil, salt, herbs and pepper. Spread vegetable mix in a roughly single layer on parchment lined cookie sheet. Bake at 375 for 30-35 minutes, stirring occasionally. Meanwhile, open the two cans of chickpeas, drain all of the liquid from the can, and rinse well with warm water. Drain completely. (I like to lay the chickpeas on a couple sheets of paper towel to make sure they are completely dry.) Place chickpeas in a large mixing bowl. When vegetables are soft and just starting to brown, remove from oven. Pour the entire contents of the tray into the bowl with the chickpeas. (Make sure to get all of the oil, as this will become the “dressing” for your salad.) 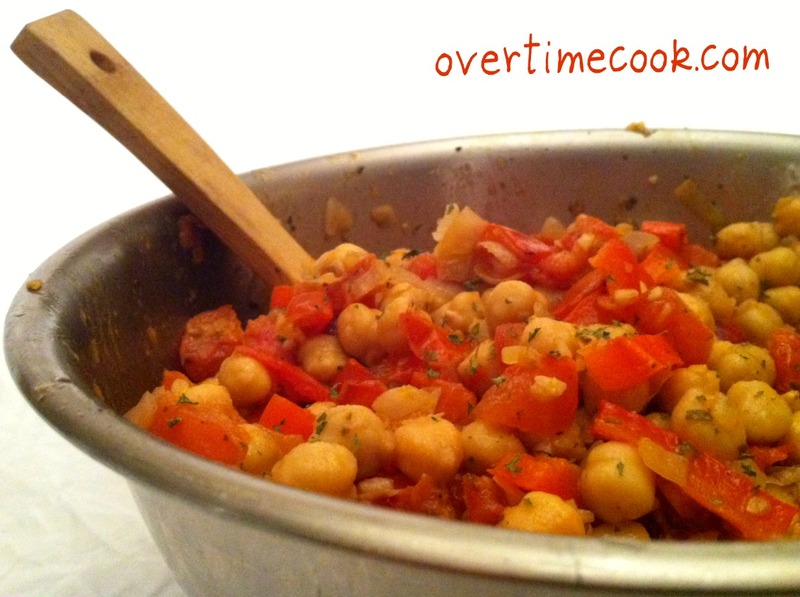 Toss the vegetables with the chickpeas. This salad is delicious served warm when freshly made, but believe it or not, it is possibly even better served cold the next day, after all of the flavors have had a chance to seep in. Looks delicious!! Thanks for posting! Sounds good! Btw, I also can’t stand tomatoes, and I cook italian all the time. The trick to being able to eat one is getting rid of the peels. The peels, imo, are the deterrent, so blanching them prior to use is an option. For the record, it takes about an hour to blanch 30 lbs (about 60 medium) of Roma tomatoes. This recipe is just up my alley! Thanks for sharing! delicious recipe! i left out the tomatoes because i also dont like them and am not brave enough to try them – but it was great all the same. i will definitely add this to my list of salads for shabbat and weekday! 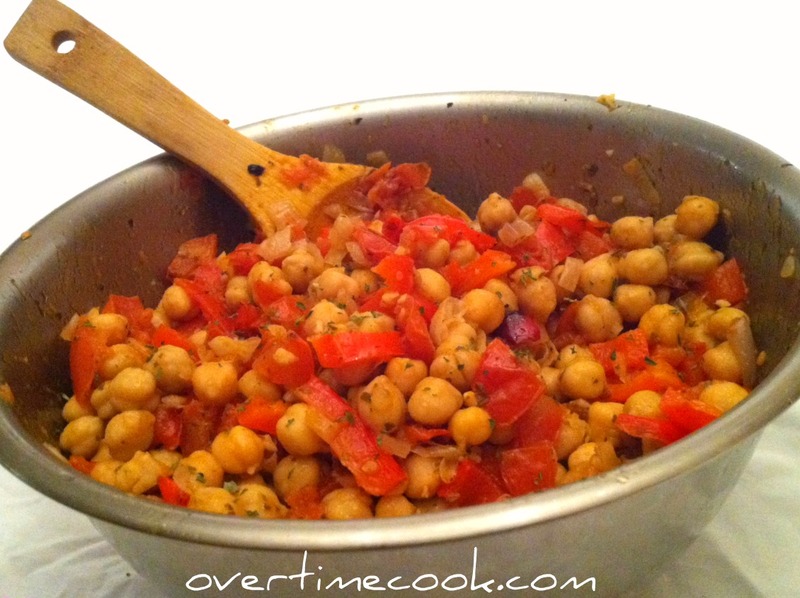 I made this with one can of chickpeas instead of two, for those who aren’t such huge fans of chickpeas. It was delicious! what size cans of chickpeas are you using? What are shallots in Israel…anyone? Just a standard size can (about 15 oz). If you can’t find shallots for this recipe you can sub a purple onion. I made this for Friday night and I had to stop my husband from eating it all on Friday afternoon. He declared it a real winner! Thanks. I just made this salad for SHABBAT….. Sneaked a taste… Yummmmmmmmm!!!!! I used fresh parsley and basil!!!! !